So you’re out enjoying the beauty and sunshine of a typical Florida day in one of Florida’s many outdoor venues when suddenly you slip, causing an injury that lands you in the hospital. The medical bills are piling up, and you’re unable to return to work right away. What recourse do you have? There are four key features of a slip and fall case in Florida: duty, notice, dangerous condition, and damages. These components can add up to a legal claim if you have been injured in a fall according to Florida statute. Duty: Every property owner (or lessor) has a responsibility to maintain safe and orderly premises, particularly when the public is exposed to the area. If there is an issue that could potentially cause harm to someone, they must make a reasonable effort to correct the problem. Loose tile? Lifting linoleum? Spills? Uncovered hole? Insecure handrails? 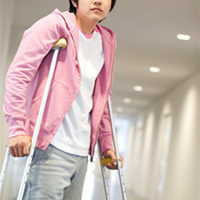 These are all issues that, left unattended, could lead to a lawsuit if someone is injured. Notice refers to the property owner’s knowledge that a problem existed and should have been corrected. If a spill occurred two minutes ago and was not mopped up, a claim of notice may not stand. But if a railing has been loose for weeks, it is reasonable to expect the property owner to have been aware of the problem, and to have corrected it. Dangerous condition: When the property was used as intended, and a hazard existed that was left uncorrected, it may be said that a dangerous condition existed. If a skateboarder “rides the rails” and it results in a broken arm, the court may find that because the property was not used as intended, there are no grounds for a case. But if a handrail detaches from the wall during normal use resulting in a fall, that is another matter. Damages: If the other elements of the case are established, the final piece of the puzzle is proving that the injuries incurred are a direct result of the fall. If you have a neck injury, but also were involved in a car accident a week before the fall, you will have the burden of connecting that injury to the fall, while opposing counsel will look to tie it to the previous car accident. Gather contact information for witnesses. Seek medical attention as soon as you realize there is a problem. Seek legal advice from an experienced personal injury attorney immediately. Your health, your financial situation, and your mental/emotional state are all at risk following a slip and fall accident. Do not leave the outcome to chance. At the Law Offices of Robert W. Elton, we pride ourselves on our dedication to detail in our quest for justice on behalf of our clients. Contact us today in Daytona & Ormond Beach for a free, confidential consultation.